This dish was cooked yesterday evening for a fellow artist and occasional co-conspiritor on projects. It was served with garlic bread, rocket leaves, avacado and washed down with a crisp Pinot Grigio. Following our meal we watched 'The City of Lost Children' a film about an evil scientist who kidnaps children to steal their dreams. The film was directed by Jeunet of Delicatessen fame, and as you would imagine, was a darkly cinematic experience. Soften the onions and garlic in a pan, add the beef and brown. Add the tomatoes and puree and simmer gently for 3/4 -1 hour. Add salt and sugar to taste. Turn the pan off and leave to cool. At this point you can add vegetables such as courgettes and peppers that will cook in the existing heat. As with alot of sauces, soups and stews this mix is better left for a while as it improves flavour. To make the sauce, melt the butter then mix in the flour to make a paste. Over a lowish heat add the milk a little at a time, stirring continuously. Add the cheese until the sauce thickens. 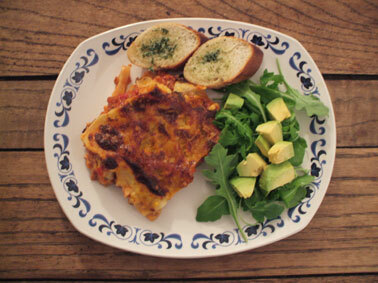 In a square dish, alternately layer sauce, lasagne sheets and meat. Usual is two layers of meat and three lasagne. Pour the remainder of the sauce onto the top and cook in at gas 6, 180c for around 1/2 hr. Leave to stand for 5 mins before serving.